In the great capitals of Europe, the heads of the police are always men of first-rate character, accomplishments, and training, and they rank with high officers in the regular army. In our own country, too often, men of a very different type have been selected for these responsible positions, and from this fact there have resulted some of the great scandals of our municipal politics. 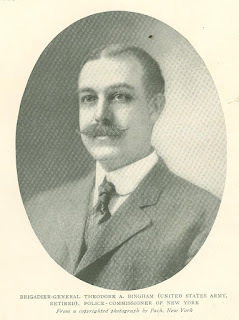 When Mayor McClellan placed him at the head of the New York police system, the wisdom of the appointment was questioned by politicians of the old school. "He'lI not last long," they. said. But General Bingham has lasted. He has brought to his task the effi­ciency of a trained soldier and organizer. His personal forcefulness and his cogent argu­ments induced the Legislature to increase his powers. Today he is going on with tireless energy to correct certain defects in the morale of the metropolitan police - defects present­ing problems which many earnest reformers have despaired of solving. Alfred Bingham, who is the commander-in-chief of New York's ten thousand stalwart guardians of the peace. A graduate of Yale and of West Point, he served in the regular army as a major of engineers, and was United States military attache at Berlin and Rome. Later he was the personal aide of President McKinley, and was promoted to the command of a brigade by President Roosevelt in 1904, retiring on the day following his promotion.